hunters. Equip arrows to use. Hold bow and press L1 to aim. 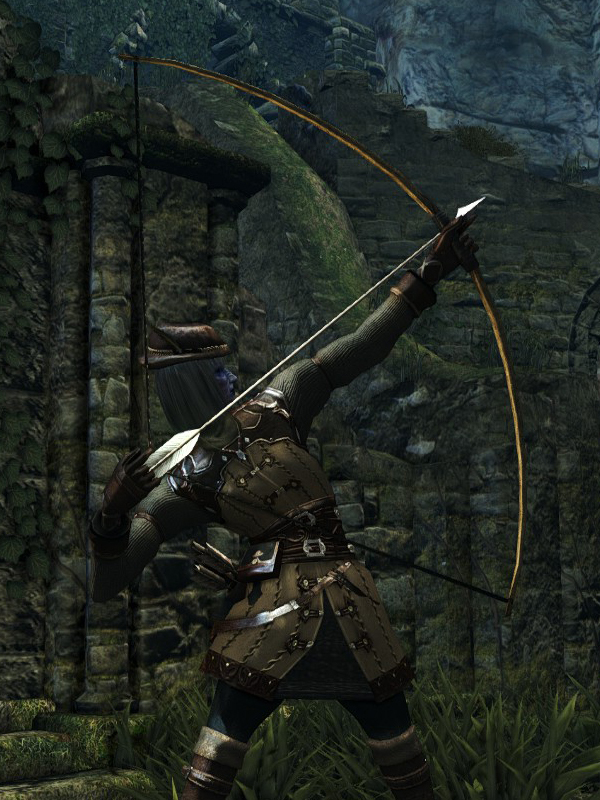 Aim for heads of humanoid foes. Press L2/R2 to change type of arrows. Press D-pad forward or back to change zoom. Found on a ledge in Darkroot Basin on a dead body with the Hunter Armor Set and some arrows. Dropped by Undead Crystal Soldier (Bow) (Rare). Dropped by Giant Skeleton Archer (Bow) (Rare). Dropped by Hollow (Bow) in Undead Asylum (Very Rare). Long Bow durability reduced to 10. Base damage increased. Cannot repair weapon (except through reinforcement). Adds magic damage. Increased damage bonus from intelligence. Adds magic damage. Increased damage bonus from faith. Divine effect 110. Adds magic damage. Increased damage bonus from faith. Occult effect 110. Adds Fire damage [Note: does not seem to be working properly - arrows do not get the fire damage effect]. Stat bonuses reduced.